I thought I'd switch gears for the next selection of the highlife turntable and start playing some Nigerian music. 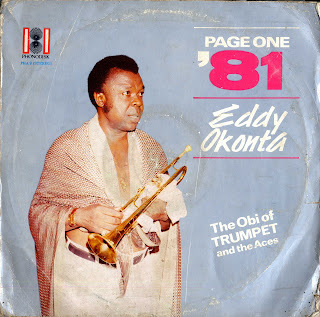 Eddy Okonta is one of my favorite 60's highlife trumpeters. Nicknamed the Obi of the trumpet his music has an exuberance that personified the best of the 60's dance band highlife style. I've listed 2 web sites that provide a lot of information about Okonta's career and importance in the highlife scene. The tune I have selected Otanjele (Sweet Banana) is off a 1981 phonodisk release and is a playful exposition that begins with a steady instrumental opening that lays down the melody and opens up into a more raucous call and response before finally exploding into a full blown highlife rant complete with frenetic horn blasts and exuberant choruses of Sweet Banana. I think the song itself is a reworking of a West African standard, but Okonta imbues the lyrics with just enough licentious charm to transform the song into a joyous romp that probably drove the crowds at the old Central Hotel Yaba wild. See what you think.